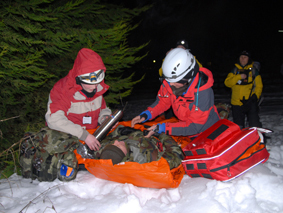 The Wilderness Emergency Medical Technician (WEMT) course is aimed at practitioners who are responsible for providing medical and trauma pre-hospital care in remote or austere environments. Training focuses on patient assessment, treatment principles and management of incidents rather than the traditional protocols associated with First Aid. A thorough understanding of principles enables the provision of care to be adapted to each individual situation and environment. Practitioners are engaged and encouraged to make differential diagnoses and then provide management that is both practical and advanced. This is completed with consultation from doctors and trauma specialists in preparation for short and extended evacuations. Click here to see course dates.